Coursework in psychology will prepare students for an increased understanding of learning and cognition, individual differences, biological bases of behavior, and developmental changes in behavior. 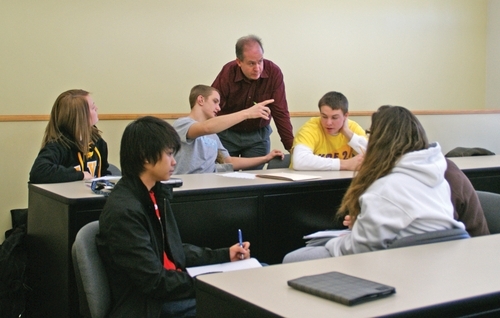 There is some flexibility built into the major to accommodate student preferences, such as the ability to take coursework in preparation for graduate school, courses introducing counseling and therapy techniques, etc. Students are also required to complete an internship, special project, or senior project toward the end of their academic career. Students interested in applied experiences typically select an internship. Those students who wish to go on to graduate school are encouraged to work on a special project involving research assisted by a psychology faculty member. Sandra Meder (Psychology and Human Services major) recently completed a research project on caregiving in the 21st century. She interviewed family caregivers across the state of Iowa about their feelings of burden and assessed what technologies caregivers used to assist them with their caregiving role. Sandra was awarded a $2,000 grant from the R.J. McElroy Student/Faculty research fund. Students have had success with placement in social work, mental health counseling, and the couple and family therapy. International Honor Society in Psychology: A Psi Chi chapter was recently established at Upper Iowa University. Undergraduate students must complete an application process, be in the top 35% of their class, and have a 3.0 GPA. Each spring new members are inducted in the chapter. Psi Chi members have been active in volunteering at a local assisted living facility. Benefits of membership include eligibility for Psi Chi scholarships and increased notoriety on graduate school applications. “Upper Iowa University (UIU) has a top-notch program for students interested in the field of psychology. The professors are not only knowledgeable in their areas of study but have hands-on experience in their field. Wages: The median annual salary for a psychologist was $69,280 in 2012 or $33.31 per hour.